It’s never been very clear to me why a virus would want to invest in blocking MHC class II. Since there are viruses that apparently do invest this way2 I may be missing something about virus-host interactions. MHC class II is certainly critical to the immune response. People without MHC class II, as in some forms of “bare lymphocyte syndrome”, have severe immunodeficiency; unless they receive bone marrow transplants they usually die as children, of overwhelming viral, bacterial, and fungal infections. That’s because MHC class II is recognized by T helper (CD4) T cells, which are the foundation of most adaptive immune responses.Â It’s easy to imagine how targeting MHC class II could benefit a pathogen. So why am I puzzled by viruses that target MHC class II? The thing is that viruses are intracellular parasites, whereas MHC class II mainly presents peptides from extracellular sources. A virus may be able to block MHC class II presentation on the cell it’s infecting, but so what? It’s the neighbouring, uninfected cell that will present the virus peptides to CD4 cells and get the immune response moving. They show that the HIV Vpu protein binds to invariant chain, a binding partner of MHC class II that (among other things) helps MHC class II traffic to the proper endosomal compartment. I didn’t peer-review this paper: I would have asked for several more experiments. Still, overall the actual association between Vpu and invariant chain looks fairly convincing, and there does seem to be an effect (though not a terribly impressive one) on overall MHC class II surface expression and on antigen presentation. 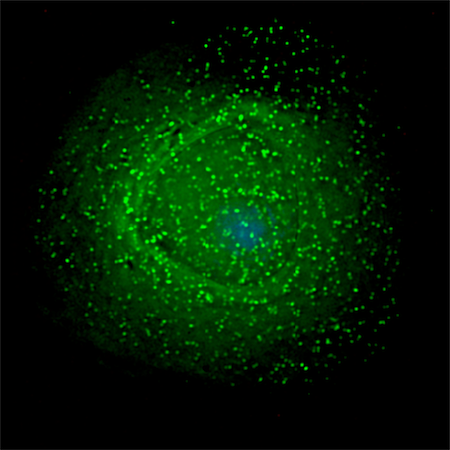 This is not the first time a viral protein has been shown to affect MHC class II. The human cytomegalovirus proteins US23 and US34 both affect MHC class II as well as MHC class I; herpes simplex virus is supposed to attack several steps in MHC class II antigen processing,5 again as well as MHC class I; and there are a handful of other examples. Aside from the HCMV US2 story, few have been studied in any detail, as far as I know, and in no case is their role in pathogenesis known. So how might it make sense for a virus to block MHC class II antigen presentation? There are some ways in which this would make sense, but I don’t think any of them are particularly good answers. (2) The virus infects enough antigen-presenting cells to impact the overall CD4 response. I think this is the most common assumption, but … Eh. Maybe. 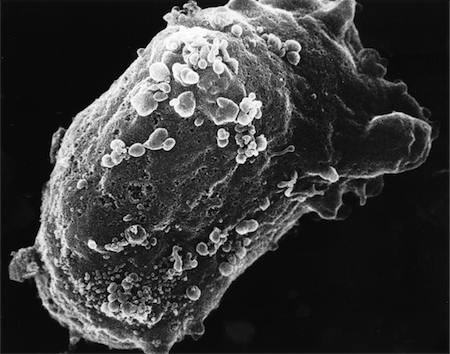 In the early stages of infection with HIV or HCMV, a significant minority of macrophages and dendritic cells might be infected, but I’m dubious that there would be enough to have much of an effect — even less so for herpes simplex virus, which isn’t known for infecting these kinds of cells much at all. (3) The virus is protecting against direct recognition by CD4 cells, rather than classical helper-type activity. While MHC class II mainly presents peptides from extracellular sources, the pathway presents a fair amount of intracellular antigen as well,6 and CD4 T cells can be cytotoxic, just like MHC class I-restricted CD8 T cells. This is actually my favorite explanation, but I’m not blown away by it; I’m not sure how common cytotoxic CD4 cells are, for one thing. For another, the rather wimpy effect of Vpu on MHC class II expression that Hussain et al showed here, doesn’t strike me as sufficient to prevent CD4 recognition — though they didn’t test for that, so it’s still a possibility. (4) The effect on MHC class II is an irrelevant side-effect of the true function of the protein, such as attacking MHC class I. MHC class II molecules are awfully similar to MHC class I (see this post for examples), so maybe the HCMV molecules are binding by accident. Similarity between class I and II doesn’t explain binding the invariant chain, but invariant chain was shown to interact with MHC class I molecules7 as well as class II — a finding no one has known what to do with in the 12-plus years since it was described — so again, maybe Vpu is “really” targeting MHC class I, and the effect on MHC class II is a side-effect. Or there could be some other effect on viral replication or assembly, it doesn’t have to be related to MHC class I. (6) MHC class II has some effect on viral infection other than through interaction with CD4 T cells, and it’s those (unknown) effects that the viruses are defending themselves against. This is the most intriguing possibility, and the reason I keep going back and studying these papers; but there’s not a lot of actual evidence for it.